Mighty Avengers, Don’t Believe the Hype? 6 Comments on Mighty Avengers, Don’t Believe the Hype? For most regular folks, Wednesday is known as “hump day” because it represents the halfway point between weekends. Because if you’ve made it to Wednesday, congratulations, the weekend is almost upon you. But for people like me (i.e., nerds), Wednesdays were the destination point. As a fanboy, I didn’t need to wait until Friday afternoon to reward myself for a week’s worth of work or school. Instead, Wednesday afternoons offered me a respite from the week because I could trek down to my local comic shop. You see, Wednesday isn’t “hump day,” it’s new comics day. So in honor of this American tradition, we’re going to have a weekly column here at The Nerds of Color that focuses on notable comic books debuting that week. Except this week, that is. I wanted to kick off Wednesday Comics talking about a book that doesn’t even come out for another three weeks. The book in question? 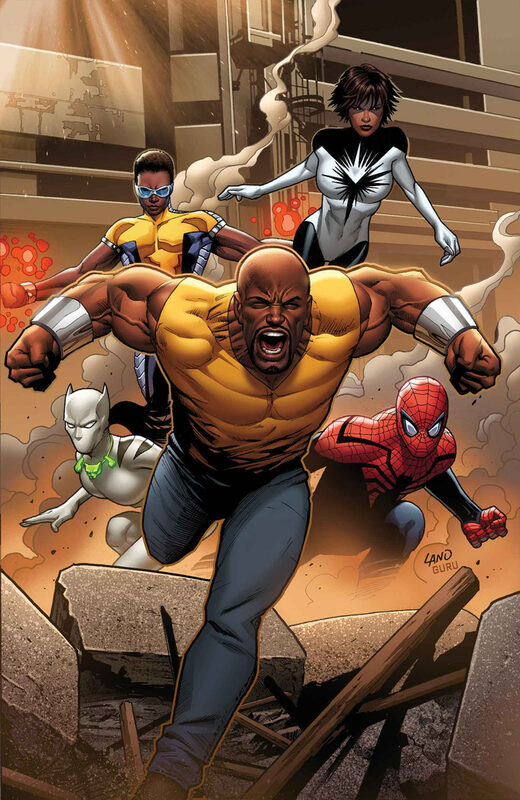 Marvel’s hotly anticipated Mighty Avengers #1, which is being reviewed in advance by multiple sites this week. And so far, those reviews cover the spectrum from good to not so great and everything else in between. There’s also the fact that this cast is predominantly made up of minority heroes. It’s never been clear how intentional the roster choices were in that regard and whether Mighty is intended as a racially charged book. That approach creates its own set of problems, and writer Al Ewing takes what is probably the ideal path by downplaying the racial angle. I wonder why the intentionality of the book’s racial make up matters so much to the reviewer. Does it have something to do with the fact that he feels such an approach is, to paraphrase, problematic? Also, why is “downplaying the racial angle” the “ideal path” for Al Ewing to take as a writer? The fact that this is even an issue for this book is precisely the point behind the conversation on “The Two Brandons” (which also includes former DC/Milestone editor Joseph Illidge. Seriously, just go and listen to this podcast. 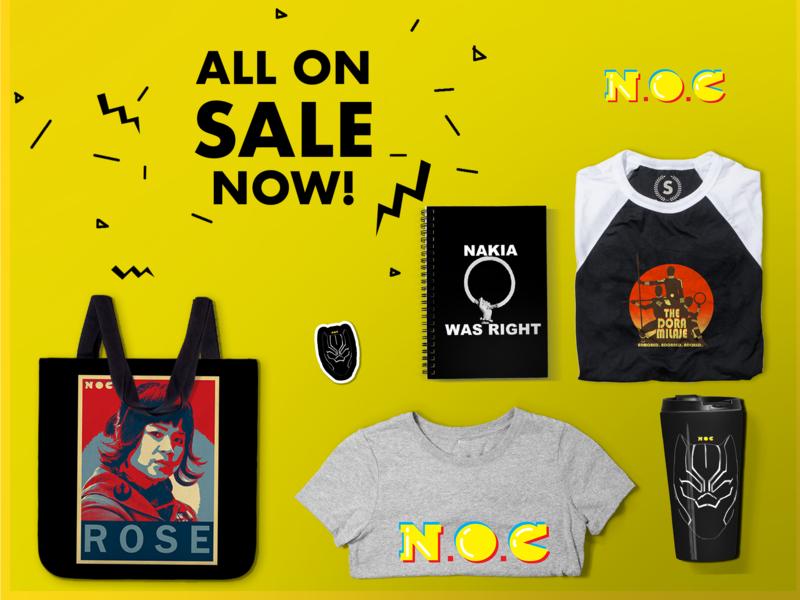 I promise it’ll be worth your time). There’s also the prickly situation behind one of the variant covers for the first issue. 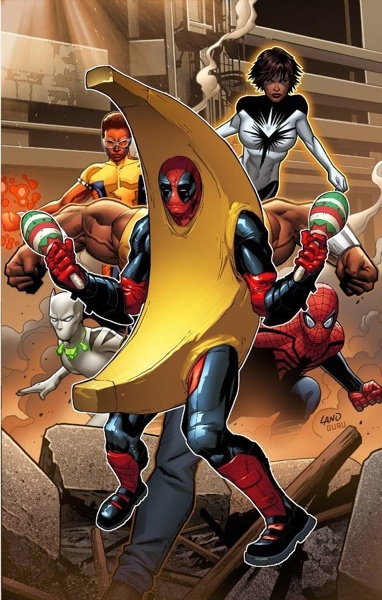 The cover features Deadpool in a banana costume holding a set of maracas superimposed over the team. Sure, it’s a reference to a (really dated) internet meme, but still. Is it really the best cover idea for such a high-profile and “racially charged” book? Really, Marvel? Bananas and maracas on a book of black and Latino heroes? Marvel tried to push the boat out to help retailers up their orders heavily. First, it launches as an Infinity book. Marvel gave retailers 15% discount off their cost of ordering 200% of Age Of Ultron #4, 10% for 175% or 5% of 150% – and making a Skottie Young cover, Blank sketch variants and Mighty Avengers Party variants available to any who did that. And… retailers didn’t bite. See, here’s the dilemma. There’s clearly a dearth of books in either of the Big Two (that would be Marvel and DC for you non-comics readers) that feature any characters of color, so the fact that Marvel has put so much behind Mighty Avengers is a good thing. That said, what happens if this book is a failure, both creatively and financially? If these early numbers from Diamond are any indication, Mighty Avengers will be seen as a disappointment to the powers that be, adding more fuel to the notion that heroes of color cannot sell in the comics marketplace. Having not paid any attention to this at all (I didn’t know the Mighty Avengers was going to be a thing and so also didn’t know the controversy), is Deadpool in the team? Why is he on the variant? And the lack of interest may have less to do with the racial makeup of the team and more to do with an apparent confusion in the hype over the title. Maybe this is just from not having been aware of the title (or the hype) until now, but it seems unclear exactly WHY this book should be purchased — by retailers or the individual collector — alike. What’s the hook? The X-men relaunch has done fairly well by hocking the first all-female line-up. But that was the clear selling point of the title. It’s less clear in this case if the lineup is intentionally novel or not. After reading this line in mighty avengers issue 3″You just saved my life, Dr.Brashier. it’s Monica..or Spectrum if you’re nasty.” I decided not to bother future issues. Is Marvel serious?